Hello and welcome to the new product launch for the My Favorite Things January 2017 release! We've been sharing projects all week long using the new products and everything is officially available now in the MFT online store! Yay!! Tonight I'm sharing a card that I created using the new Mailbox die and my favourite sentiment ever from the new Love is in the Mail stamp set. I diecut the mailbox from watercolor paper and then I coloured each piece with an ink blending tool and distress inks. I love how saturated the colours are and how textured it looks from using the watercolor paper. For the background I used distress inks and lightly blended them onto a white cardstock panel and then I added some water to give it a distressed look. Once it was dry I adhered the mailbox over top with foam adhesive for some fun dimension. I layered the top part of the mailbox with foam adhesive so I could add some envelopes inside and make it look more realistic and then I also added one into the grass to make it look like it fell from the mailbox. You can see how I created this card in this weeks episode of MFTv on the MFT YouTube channel. Make sure to head over to the MFT blog for more creative ideas from the design team using the new release and giveaways too! Thanks so much for joining me all week and happy shopping!! Love the tiny letters in the mailbox! Another great pick for my postal working family members. Great card! What a perfectly sweet card! I really love the background and how it makes that sweet mailbox pop! Thanks for the inspiration!! This new mailbox is super cute! I just love the little envelopes that come with it! Love that cute mailbox! Awesome card! Great background and color combo too! Lovely mail card. Very cheerful and lovely. Cute! I like the texture look with that watercolor paper. 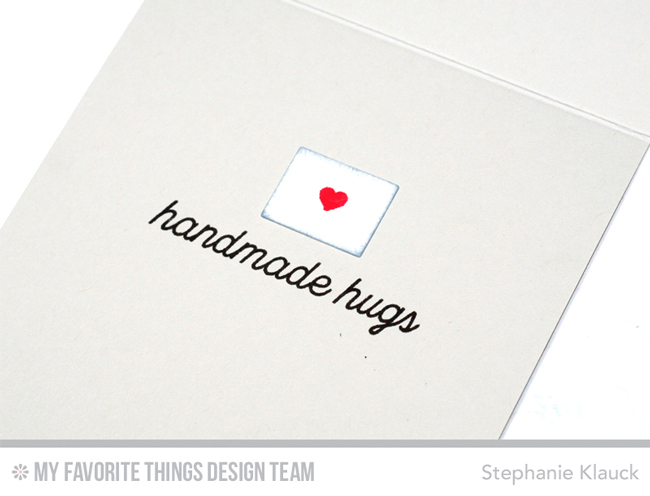 Love that sentiment, handmade hugs! Great card! Love the new mailbox! Wonderful happy mail for a rainy day! Love this die set, and love the card. This die-namics set is amazing, and your card is beautiful. Such a cute card, love the simple sentiment on the inside!! Beautiful scene - I love the colours and the gorgeous watercolour background! This is so sweet! That mailbox is fabulous!! Love the texture the watercolor provides, very pretty. Your beautiful background really shows off the Mailbox. Thanks for showing the matching inside message. Love this. The texture looks amazing, with a felt like appearance. Nice job on the details. Oh I LOVE your card and this new release!!! Love the ink blending behind the mailbox. Very nice. Beautiful card with new Products! Thanks for sharing and thanks for Amazing 5 videos! Your mail box card is super adorable! I love the mail falling out of it. Lovely! I am totally in love with that 'real' mailbox! Such a great scene. Love all the texture. Cute card, beautiful ink blending! Saw this on youtube, it is amazing! Love how you used both the front and the little envie for the interior. So simple, yet so lovely! Fantastic! I love the colours you used! This is a well designed card. I love how you anchored the mailbox on a distress inked background. Very pretty! Delightful! Love the dimension and vibrant colors! Lovely card! I love the texture of the watercolor paper! Very cute card! I love the use of distress inks and the texture of the paper. The envelope in the grass is a nice added touch. Very pretty card! Love the tulips! Just watched your video on this card tonight. It really is so adorable!! Love all the different elements of the mailbox set. Beautiful card! I really like that mailbox die. I love the way you did your background. Beautiful card!! I love the softly inked background!! Love this--I enjoyed it on MFTV. Very cute card, Stephanie! Love the fun details with envelopes in the box and one on the ground. It all looks do realistic. Enjoyed your video, too! Just awesome! Love your ink blended background and the envelopes spilling out. Cute, cute! Love all the details in the mailbox. Awesome card! My order is on the way! Great card! Love the letters in the mailbox! 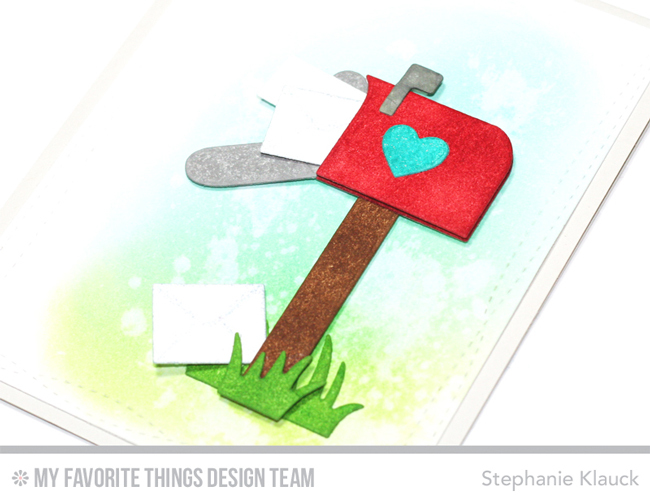 I love your background for your cute mailbox Stephanie! letter. fun idea. Cute card. Love the mailbox--and I love the sentiment inside the card! This mailbox is so cute! Love that background and the inside too! Fantastic card! Love all the detail you added around the mailbox as it allows the mail box to really stand out as the main focal point! Love it! 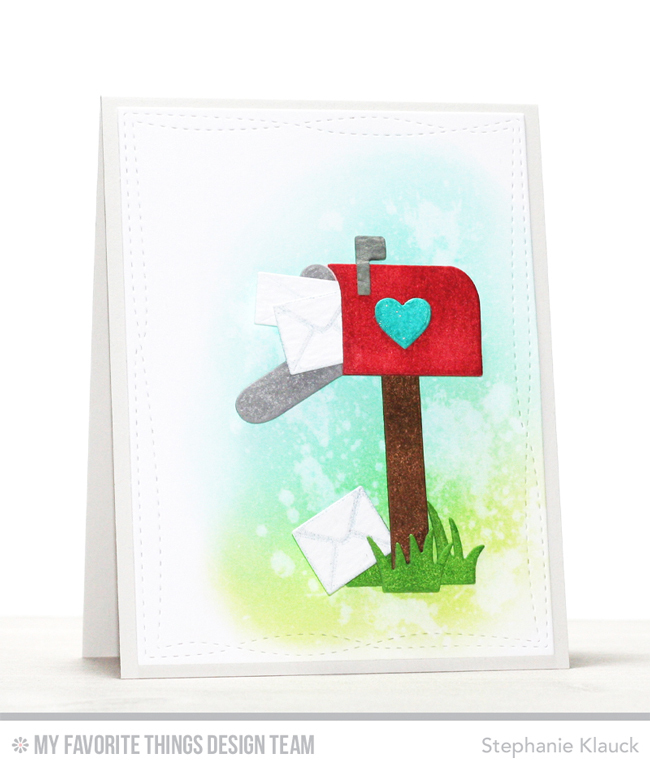 Cute card - love the little letters spilling out of the mailbox! Fantastic card. Love your background and the dimension you added with the letters. Watched your video for this card...great idea of having the letters stick out. I watched this video and love the card you created, thanks for sharing your time! The mail box is so cute on your card. Fabulous coloring! Great card, I would to get this in the mail! Super cute card. Love the background a lot. This is such a sweet card! I love the distressed ink pieces and background!! Awesome card! I love those teeny letters sticking out of the mailbox! Awesome card and beautiful blending! It's cute with the envelopes tucked in the mailbox. Love the mailbox, too cute. So cute! Love how you used the watercolor paper - it definitely gives it texture! Love how cute and simple this card is!